Kelsey Kronmiller, a graphic designer, designed this amazing LEGO aquarium, which is about 90% done and "entirely coated in "Krylon Fusion," a clear enamel recommended by aquarists to protect fish." I love all the little details. 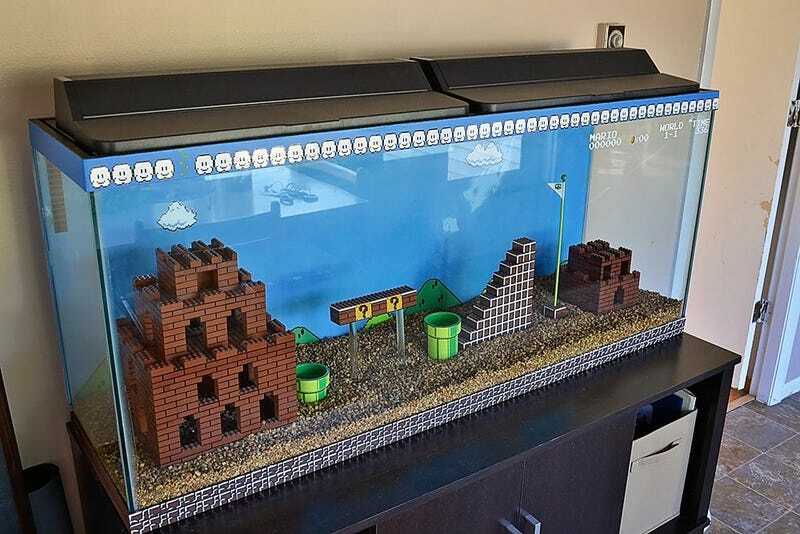 This is such a cute build and totally makes me want to build a Lego aquarium. She plans on putting an Electric Blue Jacks Dempsey, a Dinosaur Eel and a freshwater Butterfly Fish in the tank, and possibly even Rainbow Fish or Danios. When asked about what other projects she's got in the works, Kelsey says she wants to to build "a small The Legend of Zelda: A Link To The Past theme for my betta fish tank at work." Read all about Kelsey's project at The Pixelist.